Spook is a smart-phone application for children that aims to make their relationship with traditional museums more fun and enjoyable. Children, along with families or their school, often visit museums which are very relevant from a cultural point of view, but they cannot appreciate the value of what they see because of how the exhibition is organized: spaces and contents are usually designed with adults in mind. To make children remember the beauty of what they see and the importance of the experience, it is fundamental to give them a new point of view, a different layer of information that catches their attention. The game is about helping Spook, a detective ghost who investigates people who lived in a time and place related to the current exhibition. Hints about their lives are hidden inside the exhibited artworks. Five Flash demos emulate the range of activities in available in Spook. These activities are like mini-games to be played in order to get hints. They differ according to the tyopology of the artwork, the sensorial approach and the type of interaction with the smartphone. Spook is based on the Constructivism approach in the museum pedagogy. That means it doesn’t want to teach an absolute truth, but otherwise it encourages personal interpretation and curiosity, other than leave to the learner total control about what artworks he wants to engage with, in which order and for how long. Other than that, to give more varitey to the game structures, the five activities are based on Howard Gardner’s theory of Multiple Intelligences. That helped me to build a game which stimulates the whole mind of chidren and, at the same time, shows them different ways to approach an artwork, keeping their attention high thanks to the variety of the games. The project has been prototyped in two different ways. The Flash demos that emulates the five activities have been tested with children and shown to parents. 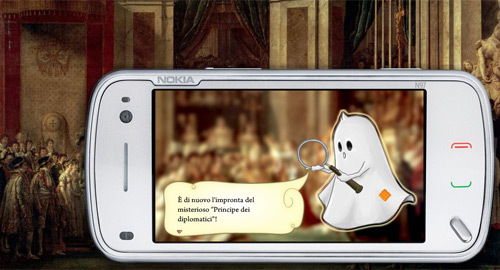 There’s also a section of the game (the Tutorial, which teaches the child how to play Spook) which has been developed in Java on a smartphone (Nokia N97), to test how the different sensors would actually react during the gameplay.